I propose to consider the hypothesis that, unless our governments take urgent action to reduce ever-increasing emissions of greenhouse gases — usually limited to mentioning only CO2 emissions — ever-higher temperatures will destroy life and plants, even threaten human existence. No substantive evidence exists to support this dangerous-warming thesis. My first question is: What is the main difference between the major parties on the supposed global-warming problem? On the surface, very little of substance: both agree Australia should reduce CO2 emissions by 5% by 2020 and produce 20% of energy from sources other than coal, gas or oil. So why does Tony Abbott threaten a double dissolution if the Senate rejects a carbon tax that could achieve the 5% emissions target, and why does Labor oppose such an abolition? Remember that Labor wants to abolish the $24 carbon tax from July, 2014, and substitute a price on carbon determined by European countries under their trading scheme. Labor insists carbon must have a price and claims Abbott’s direct action plan will not achieve the 5% objective. Better to have major Australian corporates pay a quasi tax imposed by foreigners! As to Abbott, politically his promise to abolish the tax helped get him to where he is today, but the funding for his direct action plan of $3.4 billion will come from tax revenues. That means he is going to have a “quasi carbon tax” — a weak case for a politically risky double dissolution if it is to be pitted against Labor’s scheme. [i] Much is still unclear, so perhaps Abbott can call on support from enough of the eight independents likely in the new Senate to avoid a double dissolution. 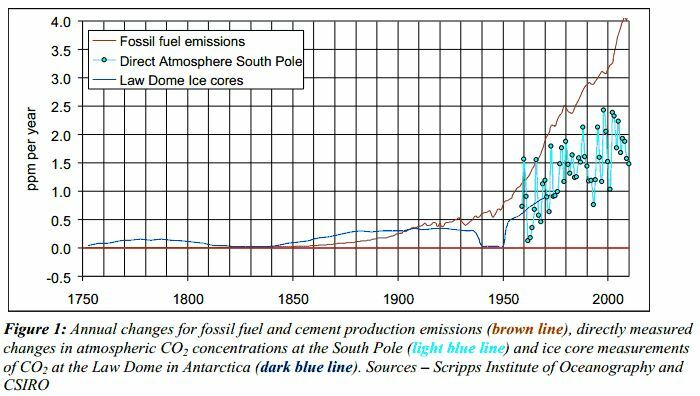 Let me turn now to the widely accepted belief that a large proportion of CO2 emissions from fossil fuels is added to the atmosphere and that the extra heat then radiates back to earth from these CO2 concentrations, causing a temperature increase at the surface of the earth. 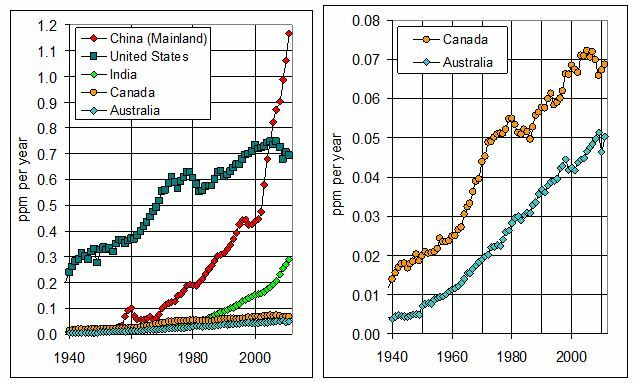 Figure 1 shows the strong upward trend in emissions, and below the main offenders — China and India. But the next step is not so widely accepted. I refer to the proposition that, if governments fails to prevent the increasing usage of fossil fuels, the increasing atmospheric concentrations must lead to danger from ever rising temperatures. True, almost all political leaders, science bodies, international organisations and media outlets seemingly accept this dangerous-warming thesis in one form or another, as does a significant proportion of the community. But since the 2007 report by the Intergovernmental Panel on Climate Change the general public has become more sceptical about the alleged danger. 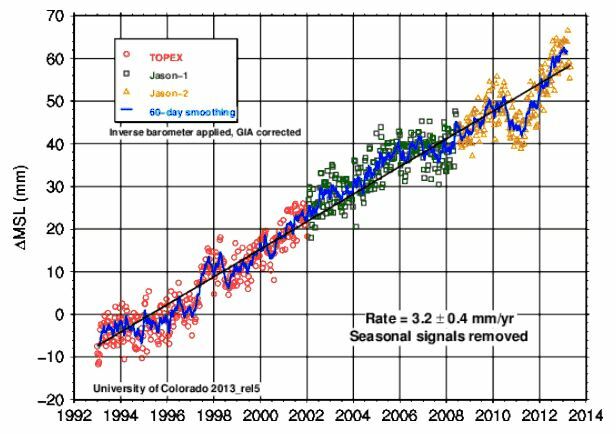 I cannot begin to outline all the reasons for this increased skepticism, although a major one has been that since 1997 temperatures have hardly increased, despite strongly increased emissions. It cannot be denied, for example, that modeled predictions of temperatures have failed badly. Other reasons include the revelation in the Climategate emails between so-called experts that they are uncertain about the science, and even prepared to manipulate data to produce results that fitted the dangerous-warming thesis. Then we have the scepticism reflected in the refusal of lower-income countries to conclude an international agreement on reducing usage of fossil fuels because they judge continued and extensive use of such fuels as vital to their economic development. A kind of catch-up has also occurred as sceptical scientists realised the dangerous-warming thesis was being taken seriously politically. Increased publications and commentaries by sceptics led to critical submissions to governments. In Australia in 2010, then-Climate Change Minister Wong even discussed a critique by four respected sceptical scientists, but she did not agree to hold an independent inquiry into the science. Australia’s professionally respected Productivity Commission has also expressed sceptical views. On the economic side, some see eliminating emissions as needed to prevent economic damage from supposedly ever-increasing temperatures. They acknowledge that eliminating the use of fossil fuels will have adverse short-term economic effects in the short term, but argue this should be accepted in the interests of future generations. Also, they insist this needs to happen quickly because, if temperatures increase by more than 2 degrees, there is a body opinion which says further increases will become self-sustaining and unable to be stopped. Of course, over an extended period the usage of fossil fuels could doubtless be eliminated and other sources of energy substituted. The possible economic effects are assessed in major 2008 reports commissioned by the previous government from economist Ross Garnaut[iv] and a similar Treasury analysis[v] released by then-Treasurer Wayne Swan and then-Climate Change Minister Wong. The Garnaut Report did acknowledge that, even if there is no reduction in fossil-fuel usage between now and 2100, there would be no adverse effects on growth. Its non-urgent claim is that “Australian material living standards are likely to grow strongly through the 21st century, with or without mitigation”[vii] (my emphasis). I judge the short-term adverse effects to be understated and the benefits overstated. Climate economist Professor Richard Tol, a former IPCC lead author, estimates the cost of mitigatory action by 2100 would be about 40 times greater than the benefits[viii] But the most important defects are the failure to recognise that nuclear power is already close to being economically efficient and that historical experience suggests continued technological advances will improve the economics of other renewable energy sources. What is the need for urgent action? As mentioned, the dangerous-warming thesis is based on the widely held belief that a proportion of CO2 emissions is added to the atmosphere and the extra re-radiated heat causes a temperature increase at the surface of the earth. But is there a causal connection between the increasing concentrations and any increase in temperatures? In considering this I draw on important new research by physicist Tom Quirk. The effect of this radiation on temperatures is open to serious debate. Bill Kininmonth, the former head of the Climate Centre of our Bureau of Meteorology, argues persuasively that the evaporation from the oceans (which constitute 70% of the earth’s surface) has an offsetting effect on upwards temperatures from radiation. Accordingly, although IPPC modelling assumes there will be a positive effect on temperatures, the evaporation may involve sufficient temperature damping to significantly reduce the temperature increasing from the radiation. This is a major uncertainty about the proposition that we face dangerous warming unless countervailing action is taken. It is important also to examine what might be termed supporting evidence. Moving to the relationship between temperatures and emissions, look first at Figures 4, 5 and 6. Figure 4 shows both annual averages and ten year averages for global temperatures from 1900 as published by the Hadley Centre of the UK’s Met Office and used by the IPCC. This demonstrates the considerable climate variations from year to year[xii] but it is not easy to detect the major change-points indicating changes in the trend. 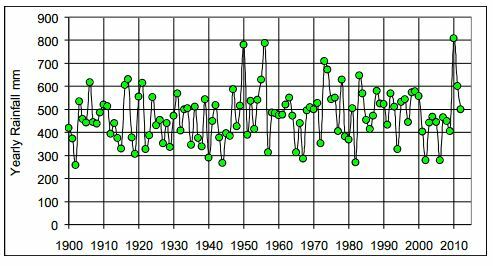 However Figure 6 shows major red dot points in the ten year averages of global temperatures and this statistical analysis shows major change points in the early 1920s, late 1940s, mid 1970s and late 1990s. Figure 5 (below) shows for Australia annual averages from 1910 as published by our Bureau of Meteorology with its supposedly high quality data. This Figure has a black line showing a major change point in the mid 1970s. 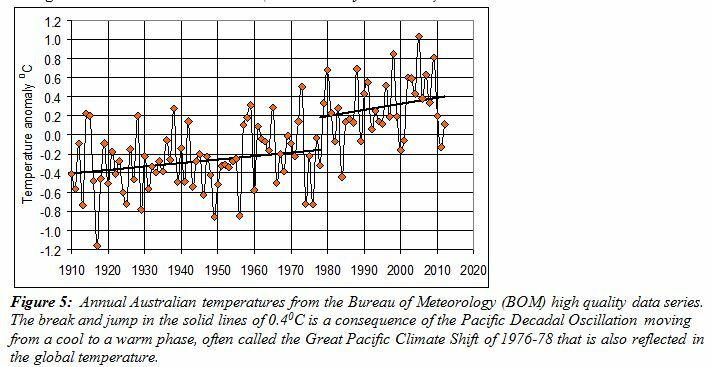 The jump then in Australian temperatures of about 0.4 of a degree reflects an ocean temperature change known as the Pacific Decadal Oscillation. This Pacific Decadal Oscillation effect is important because it reflected natural causes arising from a sudden replacement of cold water with warm water along the western Pacific coast of the North Americas. That had no causal connection with fossil fuel emissions. This analysis suggests about half of the published temperature increase over the past 100 years of about 0.8 of a degree reflected natural causes, not increased emissions of fossil fuels. Figure 7 allows a comparison of changes in concentrations with the changes in temperatures shown in Figure 6. The lack of any continuing connection between the two seems obvious. This leads to Table 1 summarising these changes in the different periods. First, there have been two periods during which temperatures were relatively stable but CO2 concentration levels increased quite strongly (except for a brief period in the 1940s). Those two periods are from 1939 to 1977 and from 1997 to the present. Second, the period from 1977 to 1997 shows both temperatures and CO2 concentration levels increasing. This is the period when the Pacific Decadal Oscillation clearly made a major contribution to the temperature increase. Third, only the 1910 to 1939 period suggests a possible causal connection between changes in concentrations and temperatures. But Figure 7 shows that period had only a small increase in concentrations. Considering all this analysis, how can there be any definitive conclusion that a causal correlation exists between changes in temperatures and changes in CO2 concentration levels? Other reasons for questioning any definitive conclusion include serious doubts about the accuracy of the temperatures published by official agencies and used by the IPCC. These published temperatures are calculated by averaging only the minimum and maximum recorded for the day. But if the daily averages are calculated more properly by averaging temperatures every 30 minutes a vastly different picture emerges. 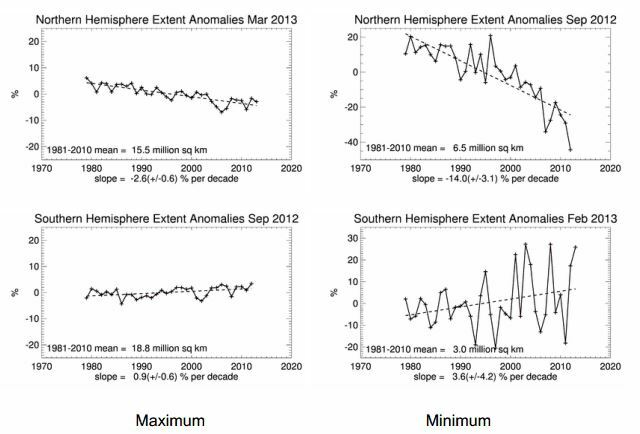 Such data is available back a few years and Tom Quirk has done the calculation for 101 days in March to June 2013 in two locations (see Figure 8). If Australian published temperatures have an upward bias so too will any modelling of our future temperatures. These systematic errors also apply to other continents where maximum and minimum thermometers are used for land temperatures[xiv]. Another upward bias in published temperatures arises from failing to take account of the urban heat island effect. In urban areas temperatures recorded include the effect of heat retained by buildings. 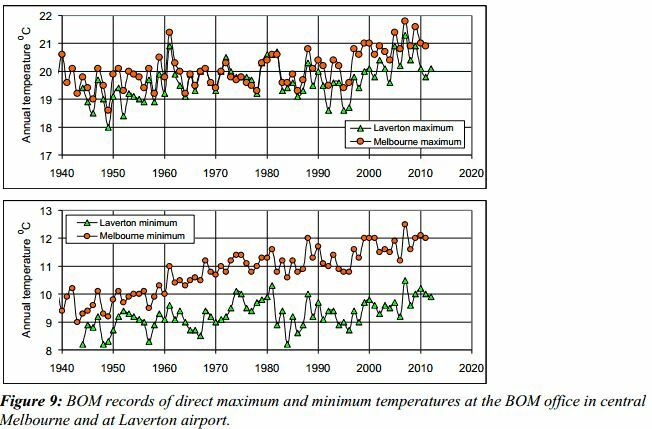 Tom Quirk has tested this by comparing the Bureau of Meteorology recording site in Melbourne with that at Laverton for the period from 1940 to 2010 (see Figures 9-10). Given the commonalities apart from buildings, urban heating is clearly the main reason for the significantly larger increase in the minimum recorded for Melbourne. However the BOM’s published temperatures appear to make no allowance for the effects of urban heating and there also appear to be other upwards bias influences in its published data. But what about the oft-made claim that temperatures are higher now than they were a century ago? As soon as August finished we were told that Australia’s eastern coast had experienced the highest winter temperature since 1910. Yes indeed, our 2013 winter temperature was 0.03 higher than in 1973 – clearly a signal of danger! Temperature records such as this do not establish a need for government action. The test is whether a causal relationship exists between increased CO2 concentrations and increased temperatures – and whether published data are correct. What is the most credible conclusion about the total published temperature increase of around 0.8 of a degree over the last century? My view is that about half is incorrectly calculated and the other half reflects natural causes. Bear in mind also that humans experienced higher temperatures than now during the Medieval Warming Period (about 800-1,100AD), and also during the Greco-Roman warm period (600 BC – 200 AD), when fossil fuel usage in both would have been very small. 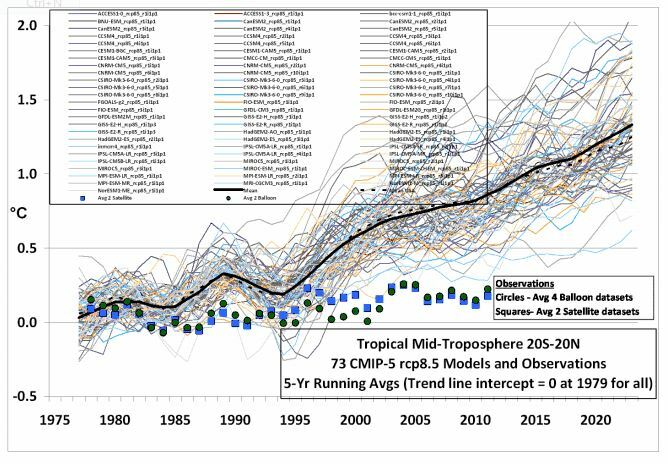 Finally on temperatures, have a look at the very extensive modelling undertaken by the IPCC (Figure 11). None of the many predictions has coincided with actual published temperatures. This is another illustration of the problems with the so-called “science” used by the IPCC. Figures 12 and 13 show a sharp increase in the contribution of methane gases to atmospheric concentrations between 1940 and 1980 and then a subsequent sharp drop. 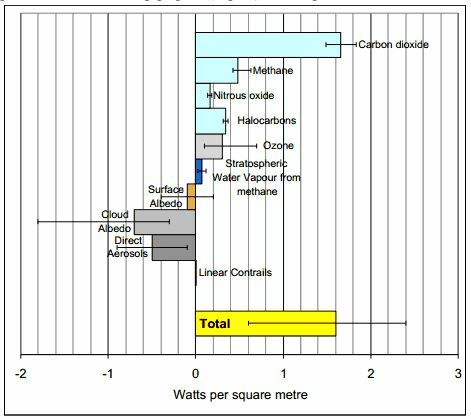 The CSIRO-BOM State of the Climate report, published in 2010, asserted that methane has shown similar increases to carbon dioxide. But both the rise and fall reflect initial leakages from pipelines and the subsequent fixing of those leakages. This is just one of many examples of the failure of the CSIRO to properly identify events which influence climate – and those that don’t. Another part of the dangerous warming scare is that below average rainfalls and droughts are a sign that higher temperatures and more droughts are on the way. But past Australian droughts occurred when global temperatures were lower than now and wet years occurred when such temperatures were rising. Annual rainfall records for the Murray Darling Basin (Figures 14 and 15) do not suggest any threat from persistently lower rainfalls or that there is a close connection between changes in average temperatures and in rainfalls. As to the Arctic (Figure 17), while there is a downward trend in ice extents, recent reports indicate that a re-icing is now in progress and extensive Arctic meltings have occurred in the past when CO2 emissions were very much lower. [xvi] Meltings in the Arctic have no effect on sea levels because the ice there is already in the sea. As to the Antarctic, the total ice area there has been increasing and satellite data covering the past thirty years show a distinct cooling of the Antarctic region. Turning to the Great Barrier Reef, a major concern relates to possible bleaching caused by global warming. However, most of the reef recovered from the bleachings of 1998 and 2002 and any action by Australia to reduce emissions would not help there unless there is an effective international agreement by major emitters. The foregoing has suggested possible errors in analysis but did not refer to the wide margins of error applying to the estimates compiled by the IPCC of the ten various possible warming and cooling influences on temperatures. These are important because the combined effect of the various influences determines what the IPCC decides is their total effect on temperatures. [xvii] (Figure 18) shows that the estimated total of these influences adds to 1.6 watts per square metre, with an error margin ranging from 0.6 to 2.4 watts. This estimate is not included here in order to comment on the various influences but to illustrate the very wide potential for error. In summary, many uncertainties emerge from a careful assessment of claims that a danger exists of ever increasing temperatures. No substance can be established for that claim because no definitive causal correlation can be established between past changes in temperatures and in atmospheric concentrations of CO2. Some past temperature increases are clearly due to natural causes and new research shows published temperatures have a significant upward bias. New research also suggests that, as the extent of CO2 concentrations in the atmosphere is much smaller than previously thought, any danger from rising temperatures is much diminished. Once account is taken of naturally caused increases, of the much smaller CO2 concentrations, and of the upward bias, the need for action to reduce fossil fuel emissions disappears. Of course, some argue that precautionary government action should be taken, just as we insure our houses and buildings against damage we know may occur. But the various deficiencies in the dangerous warming thesis suggest any risk that might exist from higher temperatures could be well handled by preventative action by businesses and individuals. [i] Of course, the elimination of the carbon tax will reduce costs but with direct action plan capped at $3.4 billion over four years it raises doubts as to whether the 5% reduction in emissions will be achieved. That plan was outlined in an article published in the AFR on 3 September, 2013 by the then Shadow Minister for Climate Action, Greg Hunt. He said this could include “programs to support the uptake of solar energy and the re-vegetation of our land” and “may be a mix of energy efficiency, cleaning up waste coal mine gas, cleaning up power stations, and landfill gas. It may be reafforestation of marginal lands or revegetation or improvement of soil carbon”. It appears that it will also include government funding of incentives to encourage the private sector to invest in projects designed to reduce emissions, with bids invited for such projects and the lowest cost bids receiving some funding. [ii] The assessment that the initial or “transient” increase in temperatures is “extremely unlikely” to be greater than 3 degrees if governments take no countervailing action is an improvement on the conclusion in the 2007 report that it was “very likely” temperatures would reach up to 3.5 degrees. It arguably removes the need for urgent government action. [iii] For example, the United Nations program, AGENDA 21 was established at the UN 1992 Earth Summit in Rio at which Chairman Maurice Strong said from the chair “Isn’t the only hope for the planet that the industrialised civilizations collapse? Isn’t it our responsibility to bring that about?” Representatives of the Keating Government voted for its implementation at the Earth Summit, known as the Rio Declaration in 1992. It was also subsequently supported by the Howard Government and progressively implemented to different degrees by subsequent federal and state governments and municipal councils of all political persuasions. Agenda 21 does not officially form part of the policies of either major party but has the objective of having the environment regulated by an international body. It includes a blueprint for forcing populations to live in high density “human settlements” and for abolishing private property rights. [v] Australia’s Low Pollution Future: The Economics of Climate Change Mitigation, 30 Oct 08. [viii] “Climate folly before failure”, Alan Wood, The Australian, 1 Oct 09. 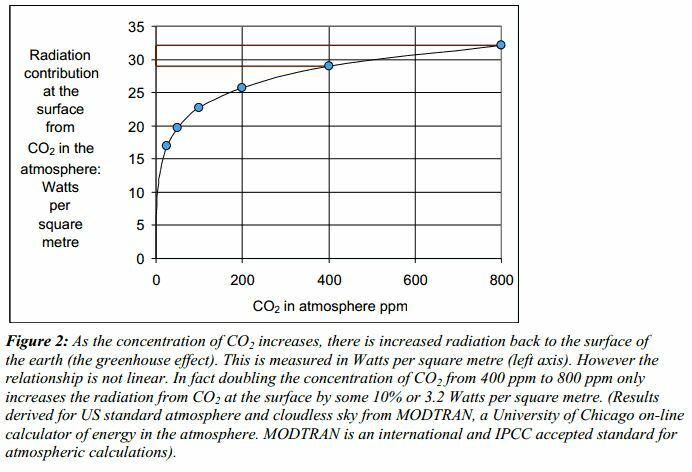 [x] This analysis comes from an online calculator of energy in the atmosphere (MODTRAN) and, as indicated, it provides an internationally accepted standard for atmospheric calculation. [xi] By way of background, it should be noted that CO2 emissions into the atmosphere are continuously exchanged with sources and sinks in the ocean and on land. That is, there are various sources of emission and absorption. In fact, the overall CO2 imbalance is only 1-2 per cent of the annual atmosphere-land-ocean exchanges of CO2. In the ocean CO2 is absorbed and dissociated in water and it is also removed by ocean plant life, like phytoplankton. The amount of CO2 exchanged (absorbed or emitted ) with the oceans varies with water temperature: the higher the water temperature, the less CO2 is absorbed or the more is emitted and conversely for a lower water temperature. Also, the behavior of oceans varies. There is absorption taking place in the North and South of the Atlantic and Pacific oceans whereas the tropical oceans are emitters of CO2. Overall, the oceans are net emitters of CO2. For the land the sources of CO2 emissions are plant decay and fossil fuel usage. The sinks are plants that with photosynthesis absorb CO2, with the extent of absorption by forests being very high: they are net absorbers of course. [xii] Including from El Ninos. [xiii] For example, a 10 minute 1degree fluctuation that increased the temperature would give a 0.5 degree increase in the average calculated by the maximum and minimum method whereas it would only give an increase of 0.01 degree in the average calculated by taking temperatures every 30 minutes. [xiv] As ocean temperatures are measured in a quite different manner, this means there are additional systematic uncertainties when land and ocean temperatures are combined to give a global temperature. [xv] The 2007 IPCC report predicted an increase in average global sea levels to 2100 ranging between 18 and 59 cms (about 2 feet). The satellite measurements of sea levels from 1994 show an increase of about 3mm a year or 20cms by 2100. [xvii] According to the IPCC, this estimate of 1.6 watts explains the temperature increase since 1750.